So first of all I have to say that this review is not written positiv because I made this board. I try to review as neutral as possible and just tell the facts. All the Foilboards from Riftboards are made in a carbon-sandwich technology to get the lightest and strongest board possible. They are laminated in one step to get a very strong connection between all the layers. After laminating the boards are baked in a big oven to make them even stronger. The Beluga is 148 cm long, 42 cm wide and 8.5 cm thick (12.5 cm on the Beluga Nose). 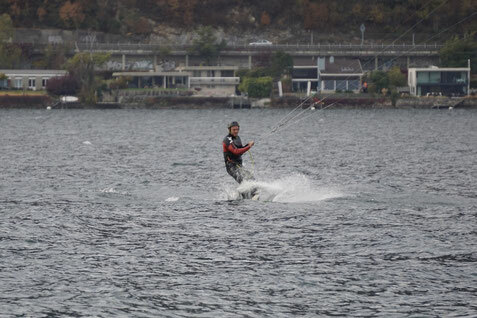 We (SK Shapes and Riftboards) tested the board on the Bielersee (Switzerland). The wind wasn't strong. It dropped one time to zero and I had to swim for 15 minutes. So we could test the low wind ability of the board very well. We flew 10m kites but I better used my 15m Sonic 2. But on this location you have to start the Kites between trees so softkites are not the best choices. We made around 50-60 km and my top speed was 55km/h. The last few month I only rode my Freeride Board. 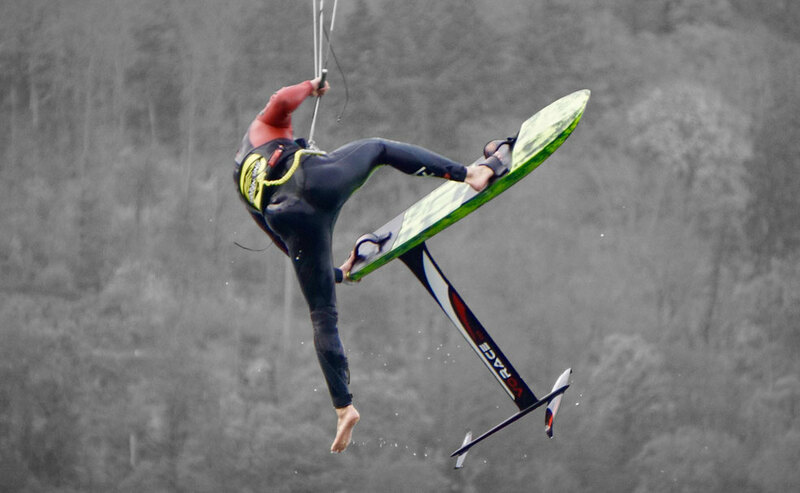 The Freeride Foilboard has a flatter rocker line so it goes on in very very light wind. The Beluga has much more rocker so first i thought i might have problems to start with a 10m kite. But what a surprise. It goes on even earlier than my Freeride Foilboard. At this point you really feel the Beluga Nose. This little extra of volume helps a lot to start. When I back looped the kite I could give full pressure on my front foot. Even on full pressure the nose doesn't sinks in. And if it does it pops out of the water very easy. With the pressure on the front foot the Board lies flat on the water and it was super easy to get the speed for foiling. The first few meters I rode the Board on the water for testing the rocker line. It felt super stable and the nose doesn't stuck in the chop. On the foil you won't have any disadvantages because of the nose. The Board feels super stable. Upwind I could lean super hard against the wind. And when the Board touches the water it doesn't slows you down. Downwind I touched the water on full speed to for testing and I never had a dangerous situation. The Board just went on as if nothing had happened. On the two pictures above I provoked a situation to get a bad nosedive. And the nose sinked in the water completely but the Beluga Nose did her job very well. Until now I never rode a Board wich forgives so much. But that doesn't mean that the Nose is unsinkable. When you stand with both feet in the front straps it sinks in the end. The test of the board was a full success. It works much better than we thought at the beginning. I don't see any pint why I should shape a normal Board in the future. Or maybe the Beluga is normal and we all rode the wrong boards before. Who knows? The low wind start ability is outstanding. The little extra volume in the nose is the thing I always searched for to have a Raceboard that I can use in low wind. Even in strong wind this nose can help you. Water touches during tacks, jibes or during your ride bring a lot less crashes with it. I don't really know how much better the aerodynamic of the Board is. But when i compare it to my Freeride Board it felt much more stable during high speeds. Fore sure I will also update my Freeride Foilboard with the Beluga Nose to complete my range. At the end I can say that the Beluga Nose is a huge advantage for Foilboards.